Sicily is the largest island in all the Mediterranean Sea, a sun-kissed land with warm breezes and rich volcanic soil that once made it truly a paradise on earth. The land and sea offered up in abundance fresh seafood, olive trees, orange groves, lemon trees, date palms, almond fields, grape vineyards, rolling wheat fields, and dense forests. Although largely deforested over the centuries in all but the northeastern corner, the island is still one of Italy’s great breadbaskets. Writers, poets, historian, and even a few locals have claimed that the gods personally took part in the creation of Sicily. One look and the first-time visitor will know what they mean. 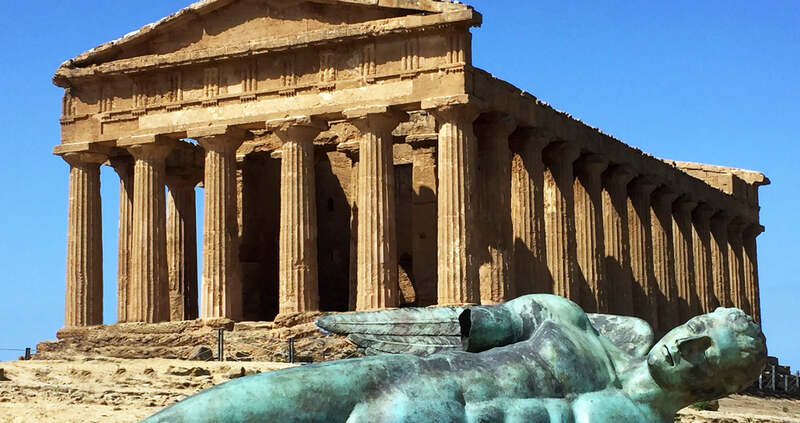 The world’s first multicultural society, Sicily is more than just an island full of art, archaeology, history, folklore, scenery and great food. It is a world unto itself. Arrange your international flights to arrive by 4pm today in Palermo. Use the airport code PMO when researching your best routes. Upon arrival, make your way to our hotel. Transfer options will be described in Final Documents emailed prior to departure. Upon arrival, check into your hotel room and enjoy some free time to explore. This evening we gather in the hotel for introductions over drinks, then proceed to a local restaurant for our Welcome Dinner (Dinner Included). Enjoy a panoramic tour of Palermo, seeing the rich and varied buildings and monuments which give the city its flavor. Later visit Monreale, a town located on the slopes of Mount Caputo overlooking the Conca d’Oro, the beautiful valley just beyond Palermo. Monreale is world-renowned for its UNESCO-listed cathedral, a dazzling mixture of Arab, Byzantine and Norman artistic styles framed by traditional Romanesque architecture. This is a perfect start to our trip, as it provides a context for the multicultural melting pot that Sicily has been for centuries. The afternoon and evening are free to explore Palermo in more depth on your own (Breakfast). After breakfast, we check out of our hotel and depart Palermo. Our first stop is Selinunte, an abandoned ancient Greek city, founded in the 7th century B.C., with ruins of an acropolis and numerous temples. We enjoy a guided tour of the primary archaeological areas here. After a break for lunch, continue on to Agrigento, located on a plateau overlooking the southern coast of Sicily. We visit the UNESCO-listed Valley of the Temples, seeing the remains of several ancient Greek temples overlooking the coast, and enjoy what we hope will be a spectacular sunset. Dinner is included this evening. Overnight in Agrigento (Breakfast / Dinner). Depart our hotel after breakfast and cross the center of the island to Piazza Armerina, where we visit the UNESCO-listed Roman Villa Romana del Casale. The villa, dating to the 4th century, contains over 35,000 square feet of mosaic flooring, featuring some of the finest examples to have come to light. Enjoy a guided tour of this incredible site. This afternoon, we continue deep into the countryside to the Baroque UNESCO-listed city of Ragusa for overnight (Breakfast). Take a guided walking tour through the labyrinthine lanes of Ragusa this morning. 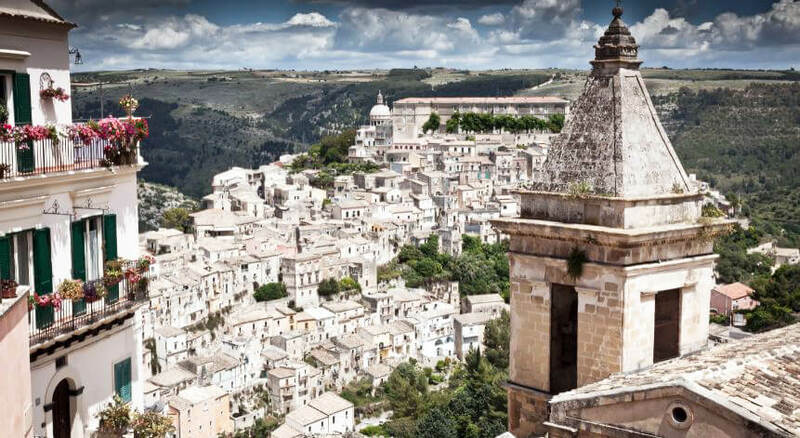 Badly damaged in the massive earthquake of 1697, a new Ragusa, known as Ragusa Superiore, was rebuilt in the years that followed on the highest part of the hill. Lower down, the local aristocracy refused to leave their decrepit palazzi and rebuilt many of them on the spot in what became known as Ragusa Ibla over the ruins. See the Duomo, dedicated to St. George, the lovely Piazza del Duomo, and the heart of the old town. Following free time for lunch, we cross to the east coast, and the UNESCO-listed city of Siracusa for dinner and overnight. (Breakfast / Dinner). In ancient times, Siracusa was the city of Archimedes, Pindar and Aeschylus, founded in the 8th century BC, and for a time it rivaled Athens as the most important city of the Greek world. Visit the Archaelogical Park of Neapolis, comprising the Greek Theatre, one of the best preserved anywhere in the world, the Roman Amphitheatre, the Altar of Ierone, some 650 feet long, and the so-called Ear of Dionysius, where limestone was quarried in antiquity. Then cross to the older quarter, on the island of Ortigia, mentioned by Virgil in The Aeneid. Visit the Cathedral, built around a temple dedicated to Athena first erected 2500 years ago and visible between the newer walls, and see the Fountain of Aretusa, a freshwater spring just yards from the sea, where papyrus still grows. 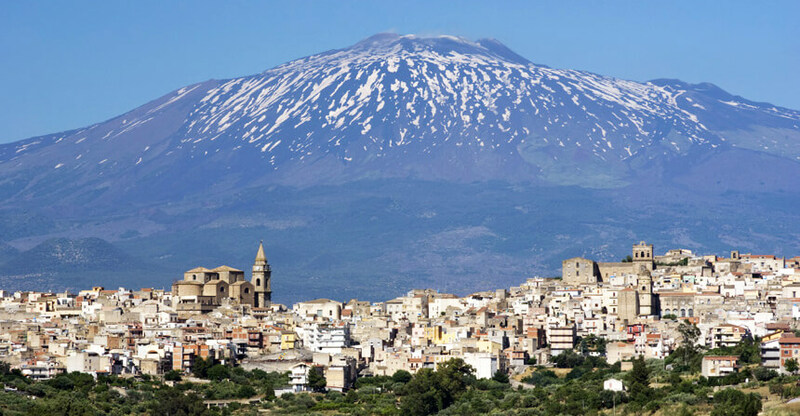 Following lunch, drive north along the coast, passing Mount Etna on the way to Sicily’s most elegant town, Taormina. (Breakfast / Dinner). Located on a wide plateau beneath Mount Tauro, for which it is named, Taormina is Sicily’s most famous resort town. It was a 19th century haunt of the English aristocracy, including D.H. Lawrence, who wrote Lady Chatterly’s Lover here. Taormina's most famous gay resident, Baron Wilhelm von Gloeden, helped to put the place on the map for gays in the late 1800s with his famous photographs of local youths. (See examples here.) 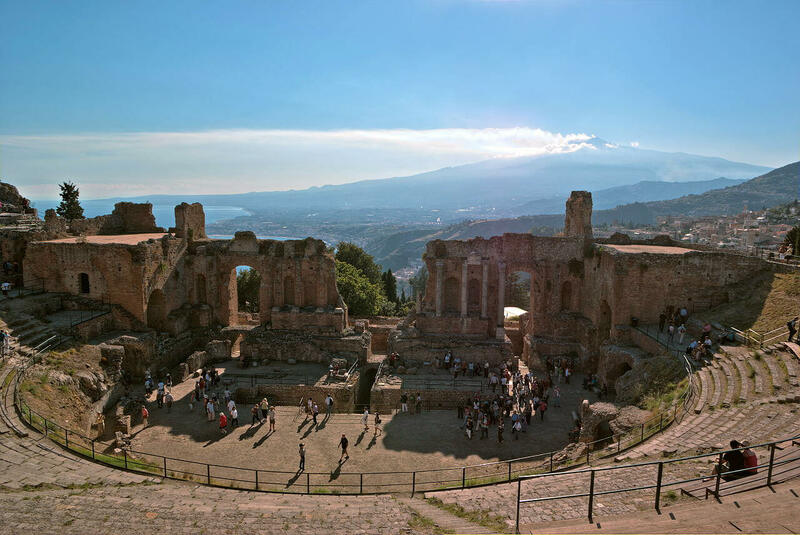 Enjoy a morning orientation walk through the vibrant town, seeing the botanical gardens, the Greek Theatre, the Corso Umberto I and the main square of Taormina, Piazza IX Aprile, for fantastic views of Mt. Etna. Reconvene in the late afternoon to take minibuses up to Castelmola, a village at the top of the mountain, viewing what we hope will be a spectacular sunset, and visiting the famous Bar Turrisi (Breakfast). On this morning’s excursion we ascend UNESCO-listed Mount Etna, Sicily’s greatest natural attraction, its highest mountain and one of the world’s most active volcanoes. Weather permitting, we travel by cable car and 4-wheel drive to get as close to the 10,902 foot crater as safety allows. The volcano has undergone major eruptions several times in the last twenty years, but it is considered safe as lava is constantly escaping. Returning to Taormina in the early afternoon, the rest of the day is free to stroll the winding medieval passages and atmospheric streets and explore secluded gardens hidden by stone walls or seaside terraces. (Breakfast). 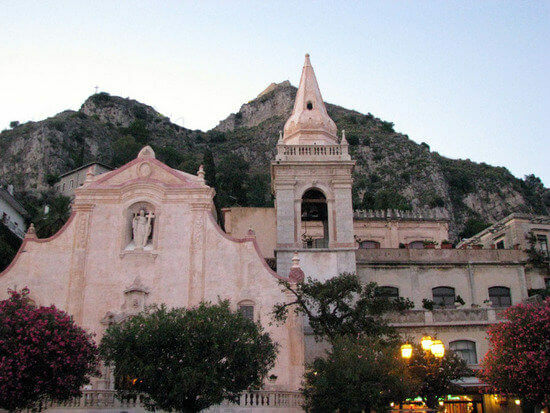 Today is completely free in Taormina for shopping, sightseeing, lazing around the hotel or heading down to the beach. Meet up again at one of the town’s most famous restaurants for a special farewell dinner tonight. (Breakfast / Dinner). The tour officially ends after breakfast this morning. We will organize small group transfers to the airport by public taxis (not included). If you wish to extend your stay in Taormina, please let us know on your reservation form so that we can keep your room available for another night. (Breakfast). Entry Requirements - For U.S. Citizens a valid passport is the only document required to enter Sicily for stays of up to 60 days. Immunizations and Health - No immunizations are currently required for travel to Sicily, but it is wise to have your inoculations up-to-date. Is your tetanus booster current? Exit Requirements - There is currently no separate departure tax required of visitors leaving Sicily other than that included with the cost of your airline ticket. On this tour, international airfare is NOT included. You will need to get your international air to Palermo, Sicily, and from Taormina, Sicily, back to the U.S.A. We encourage you to work with Steven Goldberg at Frosch Travel in Chicago, who knows the best flights to get you to and from Sicily. You will need to arrive in Palermo by 4:00 pm on April 24, 2019. Depart from Taormina on any convenient flight on May 3, 2019. In April, average daily temperatures in Sicily range from 50 to 65 degrees. You won’t need a suit jacket or tie, as the tour is informal and dinner attire will be casual, but you will want nice outfits for dinners. Try to pack light and bring only one piece of luggage plus your carry-on. Create mix and match outfits, and think about layering! Pack any medications you require in a carry-on bag and leave expensive jewelry at home. Nice casual wear for dinners. Socks, underwear for 9 days. Light sweater and windbreaker as nights can get cool. Inexpensive poncho in case of rain. Comfortable walking / hiking shoes. T-shirts / polo shirts (3 - 4). Fleece to add a layer for additional warmth. Electrical Adapter. The electricity supply in Sicily is 230 Volts/50 Hertz. Sockets are type E, requiring two round plugs. Click here to see examples and obtain more information. The Euro (EUR) is the standardized monetary currency of Sicily. Major credit cards are accepted widely and may be used at most hotels, restaurants and major shops, but you will need cash at local markets and small shops. As of May 7, 2018, the exchange rate was approximately $1.20 to the Euro. Click here to see the current exchange rate. Tipping in Italy: Italy is for exceptional service, and there are not standard rules. A service charge on the restaurant bill probably will not go to the waiter. If you are pleased, leave a few Euros to show your appreciation. Tip a porter for carrying your bags, and even a small amount to a taxi driver is greatly appreciated. We present collective tips to guides and drivers throughout the tour and will suggest a per-person amount for the group tip contribution before departure. Join us for an extraordinary experience on the sun-kissed Island of Sicily! If you have any questions, please email us at tototours@gmail.com. Price: $4,500 in double occupancy hotel accommodations. Private Room: $450 additional in a single room, for a total tour price of $4,950. Single rooms in Europe tend to be smaller than rooms for two persons. Included: 9 nights hotel accommodations; hotel breakfasts daily plus Welcome & Farewell Dinners; other meals as specified in the itinerary; ground transportation in climate controlled motorcoach; sightseeing activities and entrances as listed in the itinerary. This is a fully guided and escorted tour. Not Included: International airfare to Palermo, Sicily (PMO) and returning from Catania, Sicily (CTA); hotel transfers; ground transportation for sightseeing on your own (taxis, local guides, etc. ); meals and optional activities not specifically listed in the itinerary; camera fees; alcoholic beverages; insurance; laundry, telephone calls, faxes, or any other expenses of a personal nature. Tips to drivers and guides and other conveyance attendants are not included; tipping guidelines for our group tips will be provided prior to departure.